It was because of a glowing cover blurb by George R. R. Martin (A Song of Ice & Fire) that I picked up a copy of Daniel Abraham’s debut novel “A Shadow In Summer” (2006), but the reason why I enjoyed the book so much and have been anticipating its sequels squarely rests on the shoulders of Mr. Abraham. A graduate of the Clarion West workshop, Daniel Abraham cut his teeth on numerous short fiction including the Nebula-nominated / International Horror Guild Award-winning “Flat Diane” (2004) and the GRRM/Gardner Dozois-collaborated “Shadow Twin” — has been expanded into the novel “Hunter’s Run” which is due out September 3, 2007 for the UK (Voyager) and early 2008 for the US (EOS) — before venturing into novels with his series The Long Price Quartet, which began in last year’s “A Shadow In Summer” and continues with “A Betrayal In Winter”. 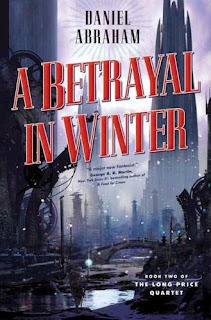 Much like its predecessor, “A Betrayal In Winter” features an intricate plot driven by complicated characters and their emotions such as love, greed and loyalty. For fantasists, the story is not exactly fast-paced or brimming with lots of sword-and-sorcery action—in fact, as understated as the magic was in Mr. Abraham’s debut, it’s even less in “A Betrayal In Winter”. Instead, the emphasis is once again on the scheming going on, mysteries to be solved, and all of the Shakespearean drama. While some of the plot devices are familiar—doomed love triangles, fratricide, male-dominated hierarchies, et cetera—the story remains compelling and much of it has to do with the characterization, which for the most part, is rich and fulfilling. Getting to reconnect with Otah & Maati and seeing how they have evolved is especially rewarding, but I did think Cehmai & Idaan were a bit conventional, and there’s definitely no one in “A Betrayal In Winter” who was quite as interesting as Seedless from “A Shadow In Summer”. Speaking of which, while “A Betrayal In Winter” works well as a standalone novel, I’d highly recommend reading “A Shadow In Summer” first, largely so you can get a better understanding of what Otah & Maati have gone through and how it relates with their present situations. Additionally, the life of a poet, what an andat is, and other aspects of the world that Mr. Abraham has created, are better explained in the debut. In fact, I was a little disappointed that we didn’t get to learn more in “A Betrayal In Winter”, given that the Cities of the Khaiem are just a small part of a much larger world according to the accompanying map. In particular, I thought there should have been more info on the Galts who play such an important role in the books but are strangely absent most of the time. And from a personal standpoint, I wish there had been more magic utilized, especially since the concept Mr. Abraham uses is so interesting. I guess I can’t complain too much though. After all, the oriental-flavored setting is quite stylish, reminiscent of Lian Hearn’s superb “Tales of the Otori” series, and the writing itself continues to be elegant and refined. FYI: Daniel Abraham is also working on a couple of comic book projects including adaptations of George R. R. Martin’s “Fevre Dream” and his novella “Skin Trade” through Avatar Press. Nice review. I'm gonna pick up a copy of A SHADOW IN SUMMER soon. I was waiting for PB on this one as it's discription didn't grab me right off the bat. I have heard good things about it, though. Hope the moving is goin smooth. Thanks! I'm glad you're trying out "A Shadow In Summer". I hope you enjoy it and feel free to let me know what you think when you do get a chance to read it. As far as the move, it's progressing. We got all of the major appliances installed--fridge, washer, dryer, etc.--, the fence for the backyard up, and a lot of little things moved with plans to move all of the big stuff this weekend. If all goes well, we should be living in the new place by next week!!! I'm in the midst of R S under R S's by Lynch right now. That boy can write!! His dialogue is quickly becoming my all time favorite! Sharp as a knife. That's good news about the move. Sounds like everything is going well.